Race Point Publishing, 9781937994693, 224pp. In Artisan Cake Company's Visual Guide to Cake Decorating, Elizabeth Marek shows beginner-cake-decorators how to get started with stylish cake decorating techniques. Learn to add ruffles, stripes, and geometric patterns to your cakes. Figure out how to create the effect of cascading petals or metallic finishes. An easy, visual step-by-step format with hundreds of stunning photos, Marek will guide you through the tools, recipes and basics of decorating. Artisan Cake Company's Visual Guide to Cake Decorating also features principles of simple cake design using buttercream frosting, fondant, gumpaste, and more. From party cakes and wedding cakes to more advanced 3D cakes, this book explores a full range of cake decorating for beginners to professional-level. 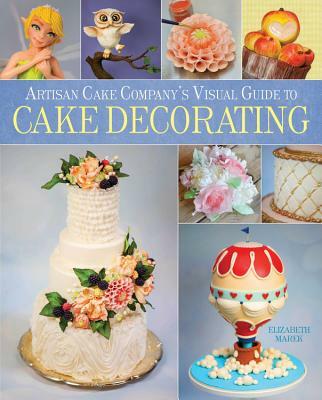 Let Elizabeth Marek's Artisan Cake Company's Visual Guide to Cake Decorating help you get your cake from boring and bland to amazing and spectacular. Elizabeth Marek has an AAS degree in graphic arts and worked in advertising before studying Pastry Arts at the Oregon Culinary Institute in Portland Oregon. In 2009, she founded Artisan Cake Company. Artisan Cake Company cakes have been featured in Portland Bride and Groom, Cake Central Magazine, and Crave Magazine. Her 3D and sculpted cakes (often representing geek culture) have been featured on various websites such as Sunday Sweets, Squidoo, Boing Boing, Great White Snark, Cupcakes take the cake, and many others. Elizabeth was included in 1000 Steampunk Creations (Quarry Books). Elizabeth's steampunk cake won first prize in the 2010 CakeCentral competition .